Two words; they return to my vocabulary each January and strike fear into my heart. At a time when most of this country is trying to recover from an extended food and festivities binge, adorable little cookie pushers with pigtailed hair and gap-toothed grins hit the streets and clog entrances at every grocery store. The preceding sentence makes it sound like I don't like Girl Scouts or their sugary wares. 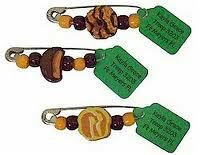 Really, the problem doesn't lie with Girl Scouts. It's found smack dab in the middle of my own weak cookie resistance. Last year I bought forty boxes of cookies. Yes, forty! I rationalized I could give them out as hostess gifts. My daughter assured me I could put them in the freezer to keep them fresh and I drank the kool-aid on her sales pitch. Forty times. The look on your face when you read how many boxes I bought is EXACTLY the same look that was on my husband's face when Child #1, having reeled in her first big fish customer (aka the person who gave birth to her) turned to him and said "So Daddy, are you going to beat mom's order?" It's not just the purchasing and consuming of Girl Scout cookies that bothers me. It's the antiquated order and delivery system. Child #1 pounds the pavement, takes orders and then several weeks later our dining room is filled with cases of cookies that have to be sorted and labeled. Customers have to be cornered. Money must be counted and kept safe in the cookie envelope. If you could see the freewheeling way my daughter handles her homework binder you'd understand why the cookie money envelope is problematic. A few years ago an aging cookie salesperson knocked on our door. I think she was eleven at the time, maybe twelve. "Wanna buy some cookies," she asked with a barely suppressed eye roll. Child #1 was in first grade. She came running to our front door, flailing cookie sheet in hand. "How many boxes have you sold? I've sold eighty-two. What's your favorite flavor? Don't you just LOVE TO SELL COOKIES????" The other girl studied her, shrugged and then looked at me. "So you probably don't want to buy any, right?" She was like an advertisement for studied unenthusiasm. That picture lodged itself in my brain in the place I reserve for snapshots of what the future of my parenting experience will look like. It's filled with things like sulky teenagers glaring out of Christmas card pictures and tweenagers with texting-trained thumbs. I thought it was a future I dreaded, but this year, with Child #1 pushing eleven, her cookie form sits in a state of neglect on her desk. It's been pushed aside to make way for texting thumbs, hamsters and sewing projects. This just might be the first year that Cookie Season and Samoa binges don't go hand-in-hand. It's a milestone. Time to retire my recipe for Thin Mint Milkshakes. And, it turns out, I'm happy to move on to whatever comes next. What milestone did you dread reaching, only to discover a unexpected happiness when you reached it? Labels: Girl Scouts. Cookies. Better in theory. Better when you aren't eating them by the box. I don't even miss Thin Mint Milkshakes. Promise. Cross my heart. I bet I could top your husband's expression. And just how much does forty boxes of cookies cost? Thanks for the warning. My husband won't let me talk to the Girl Scouts selling cookies. Not because I'll buy a box, but because I always ask if they have anything that's low-fat. He says that's mean, because I know the answer and it confuses the girls. Quote: "She was like an advertisement for studied unenthusiasm." You totally crack me up! For some reason we've gotten hit hard this year with several darling little cookie pushers ringing our doorbell. 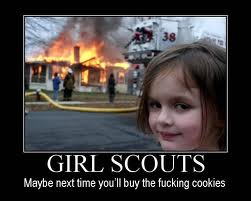 And, well, I can't have them setting the house on fire, so bring on the Thin Mints & Do-Si-Dos! Mmmmm. Love the peanut butter/chocolate ones. Are those the tagalongs? I understand what you mean about a dreaded milestone not turning out to be dreaded. I think my son starting high school at the beginning of this school year was like that for me. Alex, Funny! That's exactly what he asked me. Diane, no such thing as a healthy GS cookie. Best to stay far, far away! Ilima, I keep telling myself that, but findng it hard to take my own good advice. Wendy, my daughter should be a used car dealer. Barbara, yes they are and so good to know about high school. That still seems really far away even though I know it's not. Love the photo! Husband is the weaker of us when it comes to GS cookies. One year he bought about ten boxes. 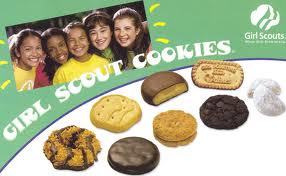 Oh gosh, I was SO happy when my girls lost interest in Scouts so I didn't have to sell cookies. Selfish I know. And we didn't even try to do anything but sell our minimum quota. I do love me some girl scout cookies. Perhaps a little too much. 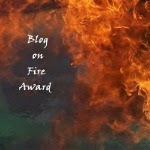 That picture with the house on fire had me on the floor...that is hilarious. My wife and I have cut off all contact with anyone who has Scout age girls for this reason. I actually wear dark glasses and use a cane when walking into Walmart during "cookie season". It's worse than flu season...at least on the waistline! I don't think I've dreaded any milestones yet, but I sympathize with the cookie-peddling parent story. Our garage used to be a regular warehouse for the entire district twice a year. I love the enthusiasm of little people. So sad when the teenager thing takes over. I am SOOO with Tammy CHOCOLATE MINT COOKIES!!!! I LOVE THEM!!! BUT haven't eaten them in years... Lol. It is sad when the enthusiasm waves. But like all people ... our tastes change as we mature. Remember how excited you got buying cool clothes for college? Well now I really want to know how to make Thin Mint milkshakes. Yum! I'm kind of amazed that Girl Scouts haven't changed the cookie delivery method since I was selling them more years ago than I care to admit. We used to have boxes of cookies all over our house too. LOL I love the photo LOL. Um, please, please throw me that thin mint shake recipe. 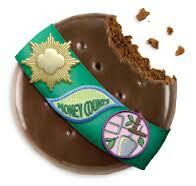 I'm rejoicing (for now) that my little one still enjoys the cookie selling/Girl Scouts in general. I too, know my time is short when it will be a thing of the past. Love it. My name is Elizabeth and I have a thin mint habit. And yes you can freeze them. And yes, they are delicious frozen too.